Get amazing salon-style results with this Ionic Facial Sauna! Are you often finding that your face doesn’t feel as clean as you want it to be? Does your skin still feel dirty and oily even after washing and scrubbing your face? A facial steamer can really benefit your skin by opening your pores; eliminating blackheads and blemishes. The Beurer FC72 Ionic Facial Sauna can aid in penetrating steam deep into the skin to give a thoroughly cleansing and moisturising facial sauna. The steam opens up your pores, removing impurities in the same manner that face masks and deep facials do without the mess. 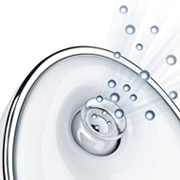 Hydrating your skin with an ionic facial sauna can be really beneficial for those who undergo deep cleansing treatments for skin that is sensitive – you can be asked to avoid hydrating your skin before a treatment which can often leave skin dry, flaky and irritated, the opposite of what you were hoping to achieve! Not only does the facial steamer benefit skin that is oily, dry and flaky, the Beurer FC72 helps to prevent rapid ageing of the skin by increasing the blood flow giving you a celestial glow, warding off wrinkles and plumping your skin for a revitalised, youthful appearance. Did you know that ionic facial saunas have health benefits too? Feeling a bit under the weather? Guess what – the Beurer facial sauna can bring you back to the world of the living. 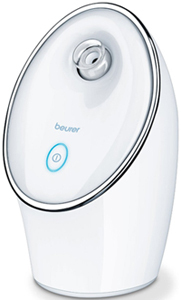 The Beurer FC72’s exemplary design allows you to adjust the nozzle so you can direct the ionic-steam up and around your nose, neck and chest to help clear your sinuses; reducing the effects of coughs, colds, various sinus problems, ear congestion and even to help ease the stress and symptoms of asthma and bronchitis. For the past century, Beurer have been the celebrated brand of Health and Wellbeing; the products that they manufacture, construct and deliver are of admirable German design and quality that will benefit your health and wellbeing which will result in a healthier looking and feeling you. Facial steaming is not something new, but ionic steaming is and it really is the BEST! Although it freshens and rejuvenates your skin; it’s definitely not the ‘freshest’ (by this we mean – newest) technique of revitalising your skin. Facial steaming is recognised as a successful therapeutic treatment that dates way back to the Ancient Greeks and Romans. As we are aware, the Ancient Greeks and Romans are renowned for the beginning of medicine, magnificent baths and aromatherapy as they recognised that hygiene was essential to health; spa treatments such as facials, mud baths, massages and aromatherapy all originate back to the Ancient Greeks. The Ancients realised that steaming draws toxins out of the body, improves circulation and cleanses the body. Facial steaming often takes place prior to a facial massage at spas; this is to cleanse the skin deeply by opening the pores and boosting the circulation by delivering oxygen and nutrients to the surface of your skin. However, we are not all lucky enough to spend time and money going to the spa every day and indulging in a facial – the Beurer FM72 is the essential device in bestowing the perfect spa treatment at an affordable price, in your home, whenever you need it most.